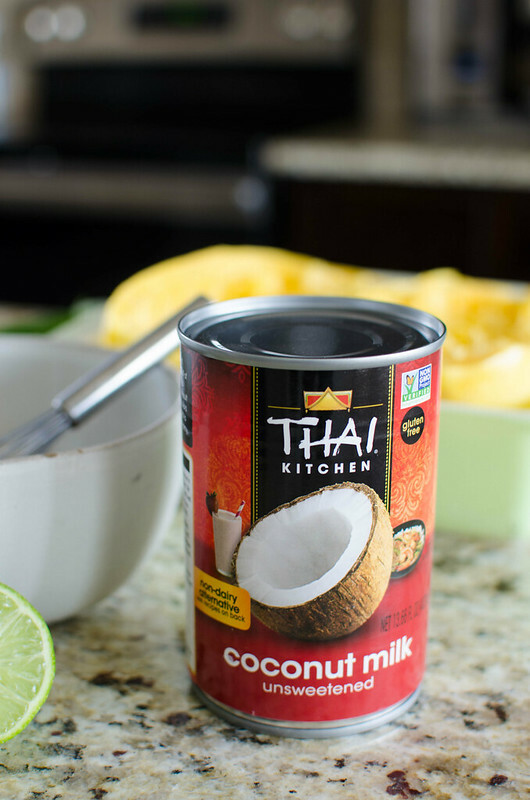 One of my favorite, favorite, favorite ingredients is Thai Kitchen Coconut Milk. It’s just 3 ingredients – coconut milk, water, and guar gum (a natural thickener made from a plant) – and it’s gluten-free, dairy-free, paleo, vegan, Whole 30 approved. Plus, it has a similar density and texture to whole milk which makes it perfect for replacing milk in recipes. 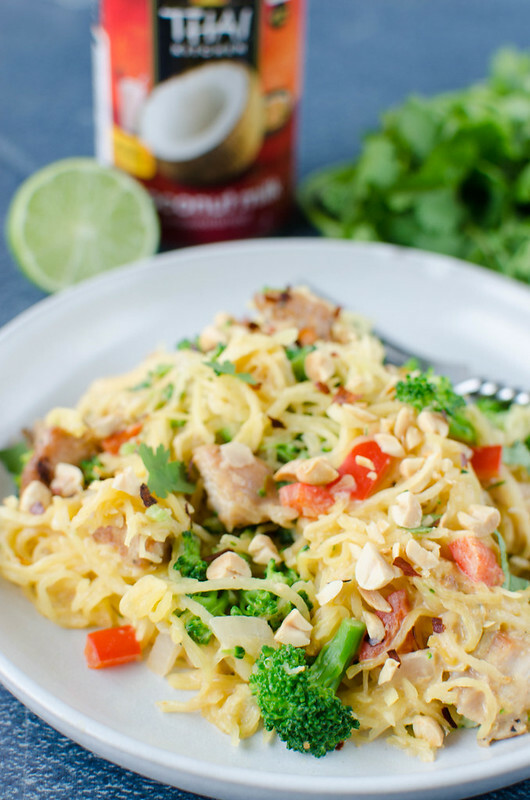 I use Thai Kitchen Coconut Milk constantly in everything from curries to paleo ice cream. It replaces any and all dairy milk or cream in my life. You can put it in your coffee (what I do when I’m paleo), add it to smoothies, or even replace the water in a cake for a super moist cake. 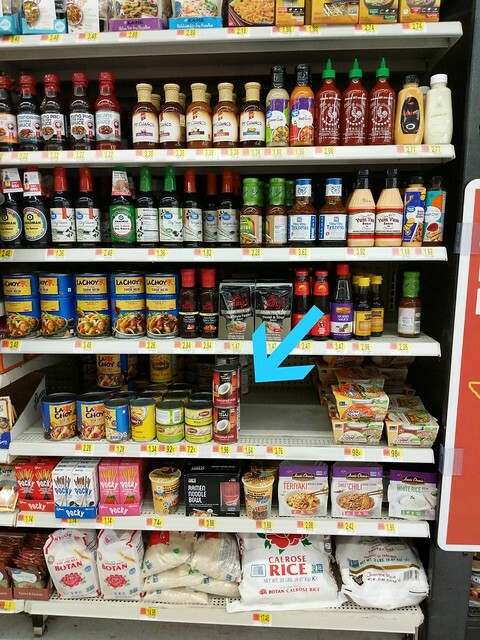 It’s also really easy to find in pretty much any grocery store (in the international food aisle) or you can order from Amazon to make your life really easy. Thai Kitchen Coconut Milk is available in Regular, Lite (60% less calories and fat than regular coconut milk), Organic, and Organic Lite (USDA Organic certified). 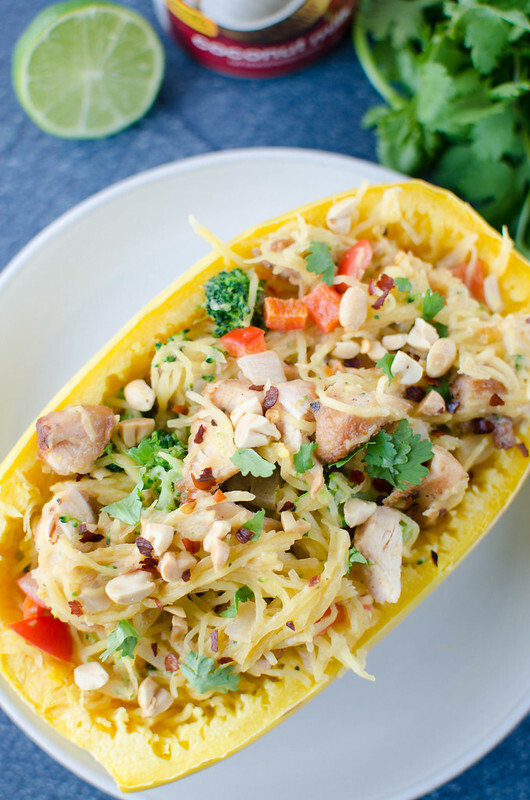 Thai Peanut Spaghetti Squash with Chicken! So for this recipe, I used the Thai Kitchen Coconut Milk to make a peanut sauce (which makes this not paleo but if you want to turn it paleo, use almond butter or sunflower seed butter and just skip the peanuts on top). The sauce is smooth and creamy and spicy and sweet. like. And then I added some grilled chicken, peanuts on top for some extra crunch, and fresh cilantro to brighten everything up a bit. To prepare the spaghetti squash, preheat oven to 400F. Line a rimmed baking sheet with parchment paper. Drizzle one teaspoon olive oil over the squash flesh and sprinkle with salt and pepper. Place cut side down on prepared pan. Bake about 45 minutes, or until the spaghetti squash strands pull apart easily with a fork. Let cool slightly before scraping all the strands into a bowl. 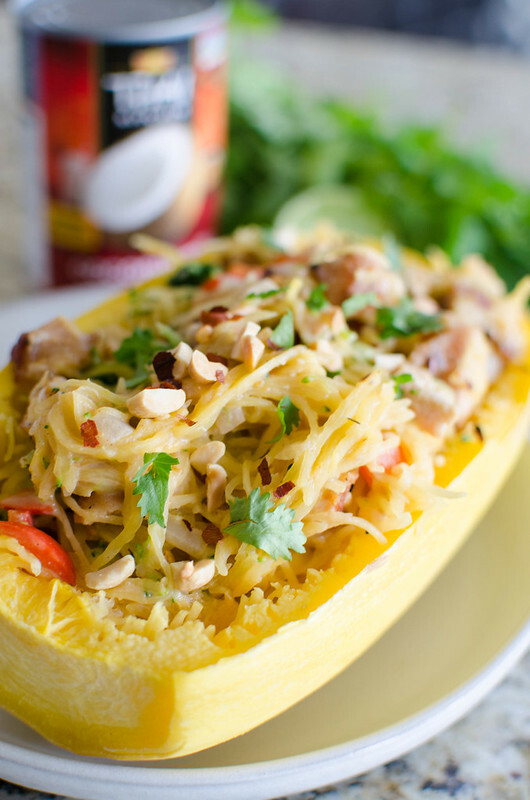 Save the outside of the spaghetti squash if you want to serve the dish in them. In a large skillet, heat remaining teaspoon of olive oil over medium heat. Add onion and red bell pepper and cook until softened and translucent. While the onion and red bell pepper are cooking, steam broccoli by placing it in a microwave-safe dish with 2 tablespoons of water. Cover and microwave on high for 3 - 4 minutes. Set aside. 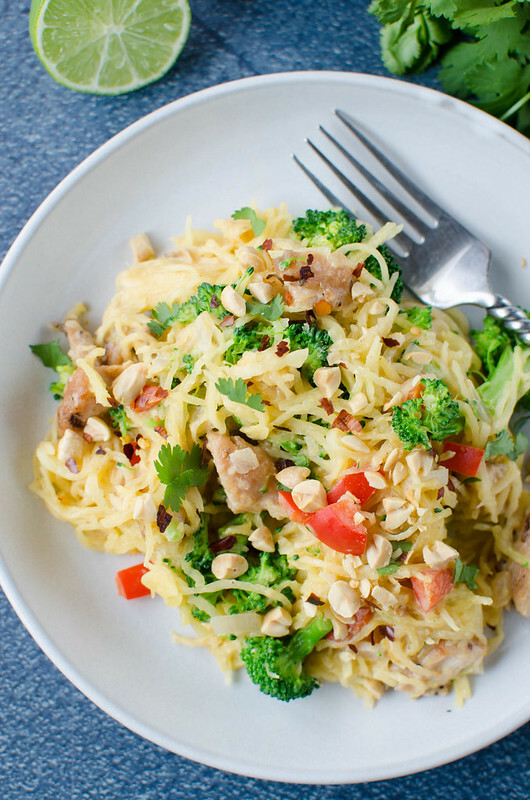 Once onion and bell pepper and softened, add spaghetti squash, broccoli, chicken, and peanut sauce. Stir to combine and let cook for 2 - 3 minutes, until sauce has thickened and coated everything well. Season with salt and pepper. 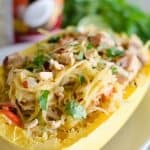 Serve inside the spaghetti squash, if desired. Sprinkle with cilantro, chopped peanuts, and more crushed red pepper flakes.